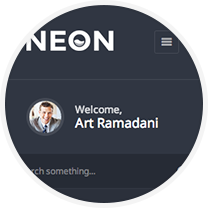 Here you will find the highlights about latest version of Neon theme. Learn more by scrolling down on this page. 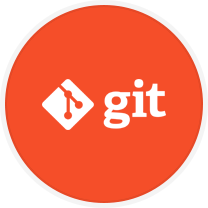 Neon contains a total number of 112 unique HTML files, and comes in four versions: standard, boxed, RTL and front-end version. 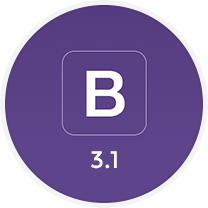 This update includes the most wanted request for Neon, latest Bootstrap 3.3.5 version. That says it all. 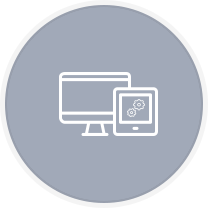 Less files are now organized in more intuitive and modern web development flow. 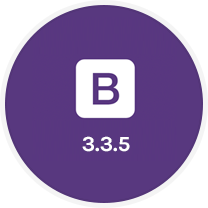 So they are now moved from assets/css/ folder to assets/less/ folder which makes very easy to update styles of this theme, for example Bootstrap update, just drop latest bootstrap files to assets/less/bs-less/ folder and you are done. This was not supported before! Since Neon v1.8 there were many updates for scripts used in Neon theme. 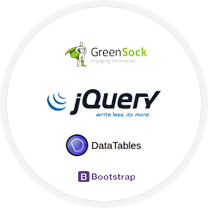 There have been updated plenty of libraries worth mentioning: DataTables, Bootstrap JS, jQuery, GreenSock Animation Platform and many more (see changelog for more details). Oh also FontAwesome and Glyphicons are updated to their latest version. Responsive issues, browser incompatibility issues and other deprecated functions are now fixed and make Neon stable for every device/screen. 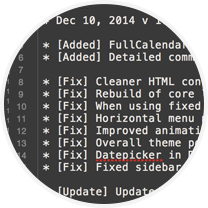 Newest version of Full Calendar is now implemented in Neon theme. It has almost the same API like the first version but includes more features such as internationalisation. Try it out, click here. 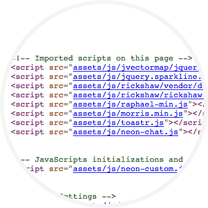 Each HTML document is correctly indented and contains information about imported resources (scripts and stylesheets) so now you will have track of what resources are included in each document. This version was released especially for boxed layout type. By just adding class "boxed-layout" to the body it will turn Neon to boxed mode. 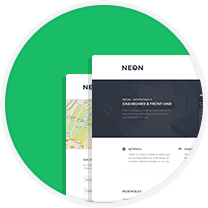 When you purchase neon, you will get Boxed layout files separately from the full width files. Try it out, click here. 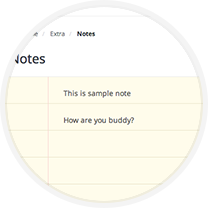 This type of page provides UI for the commenting system in back-end. 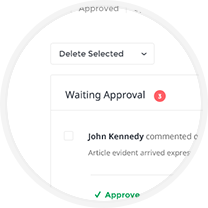 It has search, pagination, filter and edit comment form in modal. See the comments dashboard here. 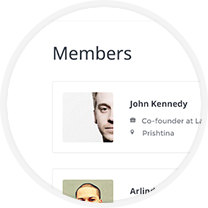 Good looking and organized way to show your members list with image thumbnail, name and other relevant user links. See the members page here. Using already existing components we have composed an example page with UI components and created "add post" page. See the add new post page here. 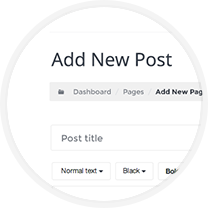 Just like the "New Post Page" this is another example that combines components of Neon and shows you how to create the Settings page. See the settings page here. 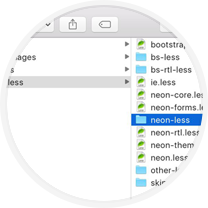 Parsing directory files in an easy way from your server is now available in this version of Neon, it uses PHP to retrieve the list of directories and files. To make it easier for you, we have included an example how you can retrieve directory list infos in "Event logger" field. See it in action. This plugin gives you the ability to create lists that are managed by drag and drop, it can be used especially for menu management. See how it works here. We love to keep up with latest updates. 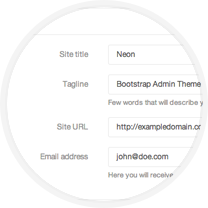 Neon is now Bootstrap 3.1 compatible! 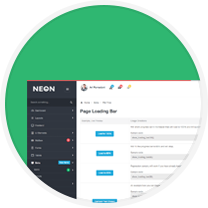 Now you can use Neon also on application front-end with variety of features and pages. 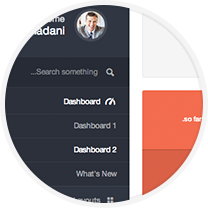 In this version, we have created 8 front-end pages and more to come in newest version. We have good news for our fellows whose primary concern is language direction, Neon now supports full "right-to-left" language direction. 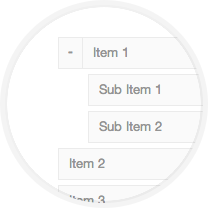 By just adding right-sidebar class to page-container element you can align sidebar menu to right side. It is also supported on pages with both menus and also in collapsed mode. See how it looks! If you are using Right Sidebar, the chat container will automatically turn to left side and chat conversation will flip from left to right when conversation is open. See it live! 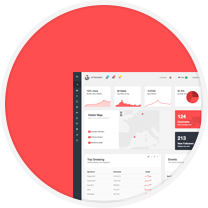 New composed page with statistics widgets, tables and panels. We introduce here the page background in this page. 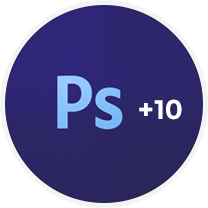 New 10 PSD files are included in this version, making total 12 PSD files. These 10 PSD files are Front-end Neon. 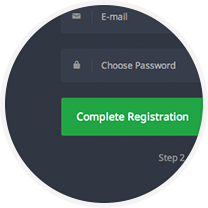 Extra versions of Login page, so now you can use these new type of pages that include reset password form and register form with steps. They both have also implemented the PHP processing via AJAX using files inside data/ directory. 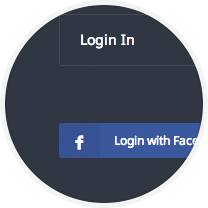 As requested by lot of users we have improved our current login page and added the login validation to it. 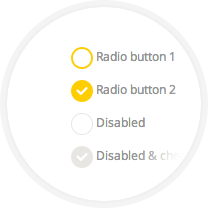 Also there you can include most popular Social Network connect buttons such as Facebook, Twitter and Google+. 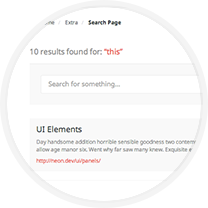 Search functionality of your site can use this new page dedicated to search and show results. 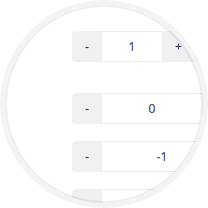 Currently Neon supports two types of results displaying, title + content + link and table results. 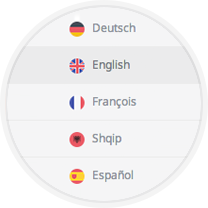 If your site or application supports multilingual content, then you are able to use our language selector dropdown. Just include the implementation code (here) to user-profile links in the header part of main content (more precisely inside .user-info element). Range specified input spinner, available in variety of colors, options and sizes. The implementation code is fairly simple. See how they work here Advanced Plugins. 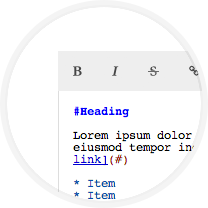 The Markdown area allows you to write in Markdown and HTML while it generates a real-time preview. 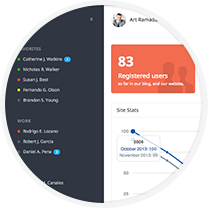 It includes a toolbar that helps you to change text appearance and add links, pictures, blockquotes and lists without having to write code. Try it! 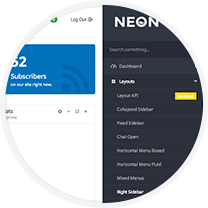 We have added the support for theme skins, now you can use custom skin for your copy of Neon theme. As a start, we have included 8 new skins, which you can also try: Blue, Red, Green, Purple, Yellow, Cafe, Black and White. 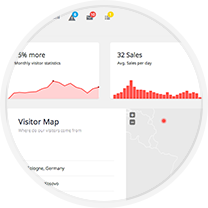 A new modern way of displaying a profile info and user timeline inspired from most popular social networks. 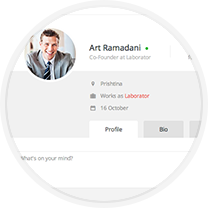 On this page you have profile header, profile tabs, status form, and three types of stories: status update, check in and photos. 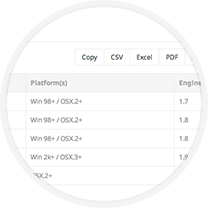 With the requests of our customers we have extended Data Tables by providing more examples with custom plugins, that will allow you to create advanced tables features such as: Column Filter, Data Exporting and Responsive Tables. We have also included basic responsive table on this page (the last table). 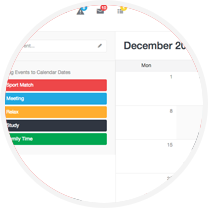 We have provided two types of Timelines on this update, vertical left aligned and vertical centered timeline. These are common types of timelines but they have different markup compared to each other. 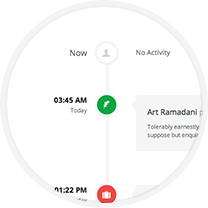 Try them: Left Timeline and Centered Timeline. 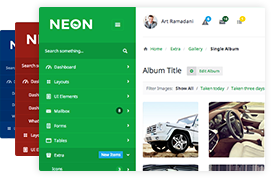 New and complete gallery elements are now available on Neon. 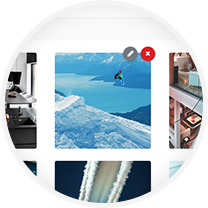 We have added Albums and Single album pages with editing (cropping), deleting, uploading and filtering features. See them in action: Albums and Single Album. 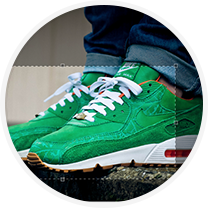 Easily crop images with Jcrop plugin which offers lot of options for image manipulation (cropping). We have included four examples how it can be used: Simple Example, Event Handling, Thumbnail Generator and Live Crop (using PHP). 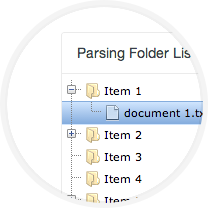 ADDED: Better organized less files, moved to assets/less/ folder. FIX: Sidebar issue "Flash of unstyle content"
FIX: Charts page will not render properly the profile notification tooltips. FIX: WYSIHTML5 editor - text colors now are applied properly. Attribute [data-stylesheet-url] solves this. FIX: Sliders (forms-sliders.html) are now compatible with Touch Devices. FIX: Fail-safe page transitions are added.